Travelling by coach is ideally suited for individuals, families and groups alike, and with services to East Midlands Airport from across the UK, travelling by coach is a convenient and cost-effective option. Looking4Transfers finds you the best prices from trusted and reliable coach operators, so you can enjoy a stress-free trip to the airport. Coach services operate daily from the Coach Park, located just a few steps away from the East Midlands Airport Arrival Hall. It is clearly signposted, just past WH Smith and up a small ramp, where you’ll also find the Coach Lounge. Services to the airport operate daily from a range of pick-up points across the UK, direct to the airport door. 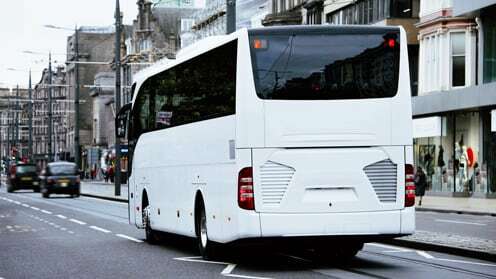 National Express - the UK's largest operator of scheduled coach services - operates direct services to and from East Midlands Airport and many key destinations throughout the UK. If you are travelling to the airport on-board a private hire coach, we have a dedicated bay in order for you to set down and pick up safely. Your private hire coach will need to be booked in, please do this by contacting us.